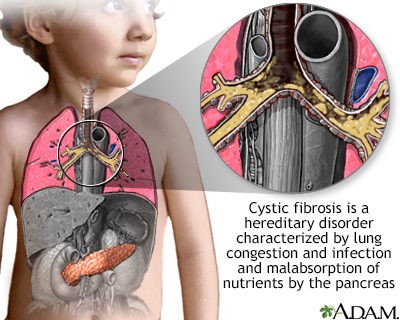 Cystic fibrosis (CF) is a disease that is passed down through families. It is caused by a defective gene that makes the body produce abnormally thick and sticky fluid, called mucus. This mucus builds up in the breathing passages of the lungs and in the pancreas. Many people carry a CF gene, but do not have symptoms. This is because a person with CF must inherit 2 defective genes, 1 from each parent. Some white Americans have the CF gene. It is more common among those of northern or central European descent. Most children with CF are diagnosed by age 2. 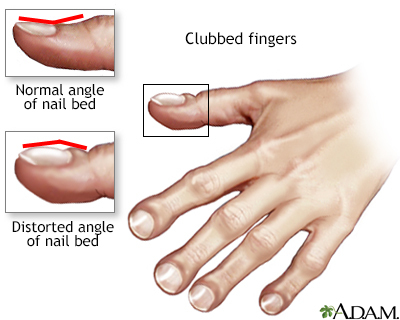 For a small number, the disease is not detected until age 18 or older. These children often have a milder form of the disease. Sweat chloride test is the standard diagnostic test for CF. A high salt level in the person's sweat is a sign of the disease. Inhaled medicines to help open the airways. Other medicines that are given by a breathing treatment to thin mucus and make it easier to cough up are DNAse enzyme. therapy and highly concentrated salt solutions (hypertonic saline). Ivacaftor and Lumacaftor are medicines that treat certain types of CF. They improve the function of one of the defective genes that causes CF. As a result, there is less buildup of thick mucus in the lungs. Other CF symptoms are improved as well. You can ease the stress of illness by joining a cystic fibrosis support group. Sharing with others who have common experiences and problems can help your family to not feel alone. Most children with CF stay in good health until they reach adulthood. They are able to take part in most activities and attend school. Many young adults with CF finish college or find jobs. Lung disease eventually worsens to the point where the person is disabled. Today, the average life span for people with CF who live to adulthood is about 37 years. Death is most often caused by lung complications. Call your provider if a person with CF develops new symptoms or if symptoms get worse, particularly severe breathing difficulty or coughing up blood. CF cannot be prevented. Screening those with a family history of the disease may detect the CF gene in many carriers. Accurso FJ. Cystic fibrosis. In: Goldman L, Schafer AI, eds. Goldman-Cecil Medicine. 25th ed. Philadelphia, PA: Elsevier Saunders; 2016:chap 89. Taylor-Cousar JL, Munck A, McKone EF, et al. Tezacaftor-ivacaftor in patients with cystic fibrosis homozygous for phe508del. N Engl J Med. 2017;377(21):2013-2023. PMID: 29099344 www.ncbi.nlm.nih.gov/pubmed/29099344.